Looking for private in-home or in-studio Accordion lessons? Our Crosby teachers are ready to get you started. Find your teacher today! Check out some of our most popular teachers near Crosby, TX including Houston, Spring, Sugar Land, Katy and Pearland. If you will notice - I am the only accordion teacher that only teaches accordion. AND MY REVIEWS - are ALL for the Accordion!! That is what I play, that is all I play, I have studied with the best - Willard Palmer & Bill Hughes. I have owned and operated an accordion music school for over 20 years - with as many as 300 "accordion" students at any one time. My philosophy - if it ain't fun - it ain't worth it!!!! I have over 500 accordion arrangements - that I use to teach with. All Genres, Classics to TOP Movie Themes - All Levels! I have conducted Master Accordion Workshops all over the US and in Alaska. I have produced instructional You Tube lessons and several DVDs. (Performed with Myron Florin at the Wurstfest in Texas for 10 years!). I teach the piano keyboard accordion as well as the B & C system Chromatic. I also have written lesson materials for the 3 row Diatonic Accordion. Before I closed the physical studio - I had an accordion teaching staff of over 6 instructors and 125 students. Lesson material will be emailed in advance. Min. Charge based on selections used. I use Palmer & Hughes instruction books and personally arranged selections for the taste of the student. I use personally produced accompaniment CDs for enhanced performance of students. I train classically (you can chose to learn all your technique and chord progressions) and instruct to the style the student wants. Pop & Standards, Italian, German, French, Cajun, Tex-Mex, etc. She was friendly and expert and helpful and made me, a beginner, feel that there was real hope! I can't think of anyone I would rather take a lesson with. Shelia is a very energetic, creative, intuitive and helpful teacher! I am inspired to learn and practice and have fun, as she prescribes! All levels and styles from classical to contemporary music. Trained and educated (MM) in Russia and USA, over 20 years experience in teaching. Individual approach to the course development based on student personality, goals, skills. Major instruments are piano, classical guitar, accordion. Student must have own instrument and desire to learn! I believe many of my students enjoy my class and are able to achieve a higher skill level because I make it a point to personally motivate them. I give them personalized goals to reach and/or tailored practice techniques.Based on response, I may offer words of encouragement or tips such as how to ease sore muscles or an alternative way to execute a technique they are finding extra difficult. trategies to enhance their skill development. Accordion, piano, classical guitar Traditional Russian School all styles and genres. Levels: beginner through advanced! This is exactly the type of lesson which helps me to improve my accordion playing skills and increases my knowledge. Exceptional musician and instructor! I highly recommend classes with Alex. Just to clear up any confusions, I do not own and do not teach: Diatonic Accordion, a Bandoneon, or a Bayan. All of which are accordion instruments that feature buttons for both hands and not just the left. I do however own and teach the 120 Button Chromatic Piano Style Accordion with Stradella Bass (Left Hand Buttons/Right Hand Piano). You do not need a 120 button bass accordion; 24, 32, 60, 72 will will also work just fine - you will just have less range available. The accordion I use is the piano type, not the buttoned. Hi my name is David with Mac's Accordion. God has been good and has allowed me to teach and perform the accordion for the last 25 years. I have students from all around the world ( India, London, Germany, Switzerland, Canada and all around the United States). My lessons are high energy and a lot of fun. I teach from the Palmer Hughes Books and add in 25 years of playing into the lesson. I also send students different styles of music that will give them a more professional sound. Here at Mac's accordion you have a choice of taking lessons from my Pittsburgh studio or you can learn the accordion at the comfort of your own home with live, One on One online accordion lessons. I look forward in starting you on your accordion Journey. Hi my name is David with Mac's Accordion. God has been good and has allowed me to teach and perform the accordion for the last 25 years. I have students from all around the world ( India, London, Germany, Switzerland, Iceland, Taiwan, Canada and all around the United States). My lessons are high energy and a lot of fun. I teach from the Palmer Hughes Books and add in 25 years of playing into the lesson. I also send students different styles of music that will give them a more professional sound. I am brand new to the world of music and the accordion. Dave does a wonderful job of progressively giving me new material to learn and is very encouraging. He is very patient. I am a mature 1st time accordion player. He made me feel very much at ease. Looking forward to our next lesson. Great first lesson. David made me feel comfortable since I am a senior and have not played in over 20 years. He was patient and encouraging. He made me feel I made the right decision to start taking lessons and to play again an instrument that I love. I still don't understand why so many people laugh when you say "accordion"! Let's show them different! This is one of the most expressive, international, fun, and emotional instruments out there! So much more than just "polkas": Argentinian tangos, German beer songs, French cafe, Southern Zydeco, Irish Celtic music, Russian folk, Italian melodic, and the list goes on... Bottom line: I love this instrument because it is FUN and VERY "produceable". Half of it is an arsenal of buttons while the other half is a good 'ol keyboard, and depending on which model you have, there are many tonal buttons to thoroughly change its personality -- no electricity needed! DI expert & programmer, writer, consultant & teacher inspiring his students to become better than they ever dreamed possible all while having FUN! I really appreciate Mark's teaching ability. He breathes music and make it easy to understand. I wasn't expecting to make that much progress or to have that depth of knowledge of music or my instrument in only 5 lessons. He gives a lot and he is eager to respond to my questions. I recommend Mark as a accordion teacher. Mark V. was great. He knew how to keep class fun and engaging. He truly cares and teaches piano in a way that is intuitive and can be applied to more than one instrument. I like Mark's approach in teaching, he gives a lot of useful information within the time of the lesson, and it keeps me busy until the next lesson. I love the classes! Teaching for 20 years. I tailor each lesson to the needs/goals of every student. Can't find a teacher in Crosby, TX? 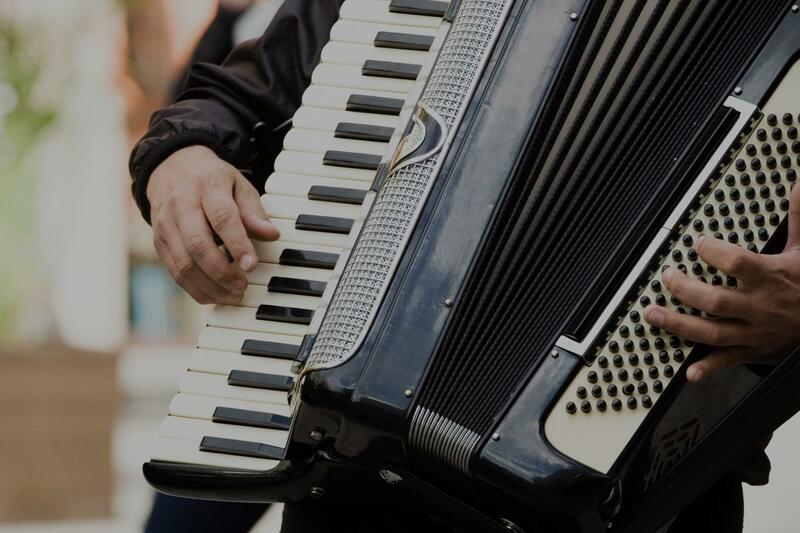 Students are raving about their Accordion instructors on TakeLessons. Check out some of these recent reviews. "Shelia's awesome! Appreciate her patience and heart for music"
Houston, TX teacher: Shelia L.
an focus on the type of music you like." ng so I looked into lessons. I am grateful that I found Shelia! I highly recommend her." "Only one lesson so far. But love her already. Very engaging, fun and lively. Will make you eager to learn and do more. More lessons ahead"
"Does anyone know if she still has the location on Richey?"